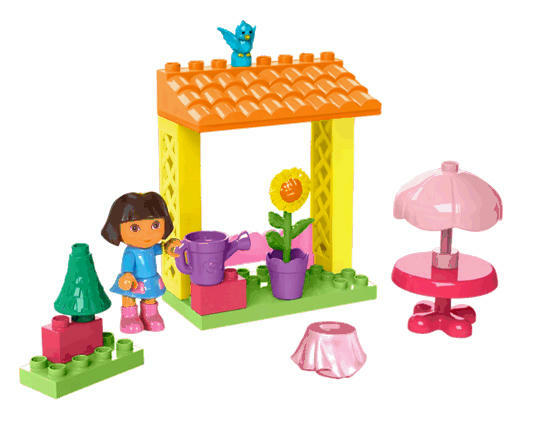 I received the Lovely Dora's Garden Gazebo from Mega Bloks for review. The review was due by May 9th, but that was Avery's birthday and I wanted to save it until then, so she agreed to let me wait a few days to write the review. As soon as I got the toy in the mail, I thought the package was small and it certainly couldn't be quite that entertaining. I was wrong! Avery loves it to pieces. She has an interchangeable skirt which Avery loves. Then there's a table, a planter with sunflower, the gazebo, a tree, a watering pot. The watering pot fits in Dora's hands perfectly. It grips in there so she can really hold it. So far Avery loves it, it's only been 3 days, but she's played with the set nonstop since she got it. She loves Dora, Dora is her favorite so I knew this would be perfect for her. It was just now when I went to the Mega Bloks website to find the link for this set that I discovered they have a TON of Dora Sets to choose from. I was offered either this Gazebo set or the Bath Time set. I'm sure she'd have been happy with either, but I liked the Gazebo better!! They have like 11 sets just from Dora alone to choose from!!! So it's super neat. I just might buy her another set or 2 for Christmas. Price: The Gazebo and Bath time are $14.99 SO WORTH IT. They also have a few for $9.99 and some for a little more as well. They have a nursery for $20, Playtime Adventure for $30. All worth it though I'm sure. Overall: ***** Getting lots of use and keeping her entertained. I signed up for the family club. I signed up for the Family Club! 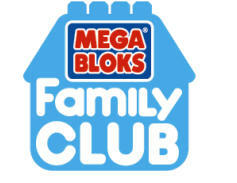 signed up for mega blocks family. signed up for family club!